The Gunung Belumut is an isolated mountain (1010 m) about 25 km east of Kluang. There is a well-maintained Recreational Forest on the slopes of the mountain, and the roadsign even annouces a waterfall there. But the river has not more than some attractive rapids. To go there, follow the road nr 50 from Kluang to Mersing for about 15 km and turn right. The water from the river is crystal clear and there were quite a number of visitors. You can follow a path along the stream for some distance. It is also possible to climb the mountain from here (guide compulsory). The most waterfall-like place we have found. On our way back we had an encounter with this beautiful, non-poisonous green snake. But there is more to see! We had heard about the Sg Yong falls nearby, and a stall owner could give us accurate directions. Not easy to find! After about 15 km from the main road, you will pass a bridge. Just after the bridge, do not turn right to the Park but go straight for 3.81 km, through palm oil plantations. Park your car and take the clear trail to the right. Not easy to find your way in a palm oil plantation. Not everybody will be able to do this. And on to the mext. As we visited these falls late in the afternoon, we had no time to visit all the tiers. 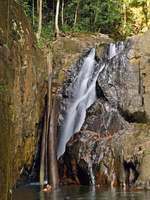 It will be worth while to come back and explore the upper falls. At the Belumut Park, we were told that there are plans to open up these falls. So better hurry, so you can enjoy this pristine falls, before it is too late! Contributed by Faye: The campsite is not accessible by 4wd anymore. Someone dug a deep wide drainage across the dirt trail at the border of oil palm plantation. A electric parameter fence had been build around the oil palm plantation too. We are thinkin visiting this waterfall. Any recommendation of transport? Also, can anyone please email me the contact details of guides/park rangers at d22032003@hotmail.com? Hey! could you please email me the contact details of guides/park rangers at cheerfulkp@hotmail.com? Thank you! 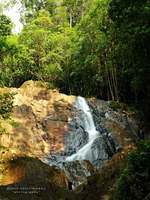 There are many waterfalls in Mount Berlumut region, they do exist. We covered 3 falls on 28-29 May2010, two are likely to be known but the other one, i believed is totally unknown/untouched and never been visited before and it took us nearly 2.5 hrs to reach from the campsite. Was here in March 2010. Rangers warned us of virus, dengue and sighting of tiger. We still proceed but have to u-turn due to bad weather. There is a very high falls in this region, anyone ever come across? Please let me know the contact no. of Gunung Belumut parks rangers office by e-mail. damn.. so many times come to berlumut waterfalls but not even realize this place was exist. might come there in weekends.. anybody wanna come with?? No 4WD needed. I went there using a van last time. Omar, e-mail me at ami_utn@yahoo.com. My home town is very close to Gunung Belumut. macam mane if we want to go there? I Mean from main road to Kawasan kelapa sawit, Is there contact no for 4WD rental? please help us. Your Comment Its great if you guys could provide essentials contact no.s such as the parks rangers office etc..